BSE Shareholder Erin Wiseman was the subject of a recent Jefferson City News Tribune article about her duties at the Jaycees Cole County Fair. 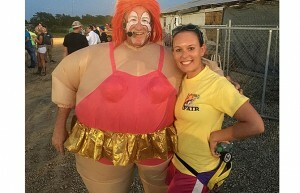 Wiseman is the local chapter president and has spent her evenings and nights making the fair run. Erin Wiseman has a general civil practice that includes Bankruptcy, Family Law, Criminal Law, Municipality Representation and Business Law. Erin handles matters in the Western District Bankruptcy Court of Missouri representing both creditors and debtors in various matters in bankruptcy. Erin also handles matters in various Circuit Courts throughout Missouri, practicing Divorce, Paternity, Child Custody, Child Support, Modifications, Traffic matters, Criminal matters, property and general business Litigation. Erin is a member of Zonta, Jefferson City Chamber of Commerce Young Professional (hYPe), Jefferson City Jaycees, Cole County Bar Association, Missouri Bar and American Bar Association. Erin is an alumni of the Inns of Court. She is also a member of the Planning and Zoning Committee for the City of Jefferson as well as the Bicycle and Pedestrian Advisory Committee for the City of Jefferson.